Gustavo Pinedo Zabala, professional soccer player, was born in Coripata, Department of La Paz, Bolivia, on February 18, 1988. His mother, Ana, and father, Augusto, were agricultural workers that specialized in the fruit and coffee harvests around Coripata. Pinedo, and his four other siblings grew up around other farm working families in Coripata where his siblings pursued their educations while Pinedo charted a path toward professional soccer. Pinedo began focusing on soccer in his early childhood. During the holidays of Los Reyes Magos (Three Wise Men) and Día del Niño (Children’s Day), his parents found ways to provide Pinedo with either a soccer ball or a pair of cleats. When he was ten years old, his family moved east to the city of Santa Cruz in search of economic opportunity. Augusto soon found work in the local stadium, Ramón Tahuichi Aguilera, where he sought to jumpstart Gustavo’s career. Augusto’s efforts paid dividends as Gustavo was awarded a scholarship to attend the prestigious soccer institution, Academia Tahuichi Aguilera. Pinedo soon rose through the ranks and began international tournaments. He played with under-fifteen, under-seventeen, and under-twenty Bolivian squads. After a tournament in Uruguay, the Spanish team, Cádiz de España, recruited Pinedo. He left for Spain at the age of eighteen and played for Cádiz in Spain’s second division. He spent the next three years playing for various teams in Spain and for Chornomorets Odessa of Ukraine’s first division. 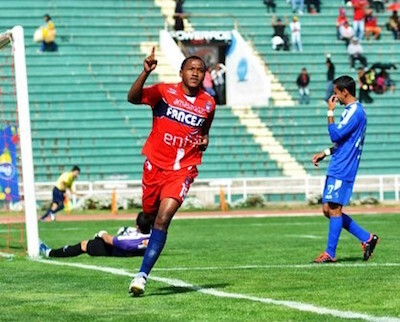 In 2010 Pinedo found his way back to Bolivia with the first division team, Blooming. Pinedo’s career took a promising turn in two different countries. Pinedo made his major mark during the 2014 season with the Bolivian club, Universitario de Sucre. He contributed to the club’s championship run, only the second national title for the team. This victory campaign opened the door for Pinedo to enter one of the world’s most prominent soccer leagues, the Asociación de Fútbol Argentino (Argentine Soccer Association). He began his play with the Argentine club, San Martín de San Juan, in July of 2014. The club began the season in the second division, but by the 2015 season, San Martín was raised to the top rank of associated soccer in Argentina. Pinedo adjusted his play once with San Martín. He noticed that Bolivian soccer and the second division Argentine league differed not only among the two, but also with Argentina’s first division. With the top division, the play was much faster and the players less forgiving if he made a mistake. This exposure and elevation in play contributed to Pinedo’s appearances with the Bolivian national team. Pinedo is currently on the roster of the Bolivian club, Sport Boys Warnes. He is married to karate champion Andrea Katrina Parada, and they have one daughter. Carla Acosta, “La Historia de Pinedo Zabala: La dura vida del boliviano que pinta para figura del Verdinegro.” Tiempo de San Juan, (San Juan, Argentina), August 2, 2014, http://web.tiempodesanjuan.com/deportes/2014/8/2/dura-vida-boliviano-pinta-para-figura-verdinegro-61983.html; Carla Acosta, “La esposa karateca de Pinedo Zabala,” Tiempo de San Juan, (San Juan, Argentina), May 24, 2015, http://web.tiempodesanjuan.com/deportes/2015/5/24/esposa-karateca-pinedo-zabala-90075.html; Josué Daniel Hinojosa Toro,“Mi sueño es jugar en el Real Madrid,” El Día, (Santa Cruz, Bolivia), March 8, 2015, https://www.eldia.com.bo/index.php?cat=154&pla=3&id_articulo=166905.